This week I will be reviewing Shar’s website, Millennial Speaks in which Shar dissects song lyrics, and has since expanded to posting about her 2 AM Thoughts and her own original songs. Shar’s apparent business plan is to bring enjoyment to her audience. I do not see anything that produces revenue for Shar on her website right now. I think there are options for monetization for Shar. She can always try advertising, I understand if she wants to avoid cluttering the website with ads, I feel the same way towards my website. It still is a legitimate option she could look at. Shar could also look to partnerships with companies that are also related to music. I noticed that Shar has a Spotify playlist linked at the top of her blog, it would be really cool if she could foster a partnership with Spotify surrounding the creation of playlists. I know at this stage that might be a faraway dream, but it is important to not lose sight of any monetization goal. Shar herself is writing music, and there are definitely a lot of smaller musicians that could benefit from a having their song featured in a Dissected Songs post on Shar’s website. Shar could barter a featured post for copies of their music, as a way to receive some sort of revenue from her site. Shar tends to ask for direct actions from her audience. 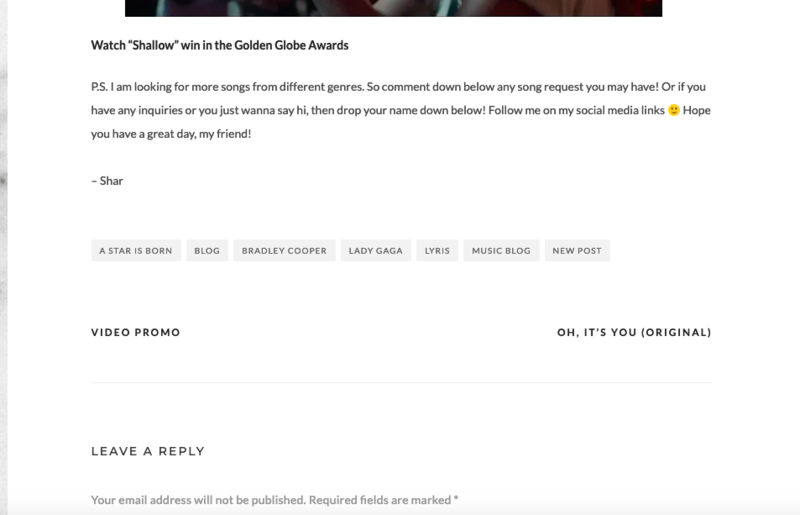 In her blog post in which she dissects the lyrics to Lady Gaga and Bradley Cooper’s Shallow, Shar asks her audience to comment any song requests they may have. This call to action allows for Shar to respond to what her audience wants and helps her to better understand who they are through the music they listen to. Shar would benefit from consistently asking her audience for their contributions. Shar’s second peer review was done by Vanessa. Vanessa outlined a few recommendations for Shar including, playing around with different fonts, and adjusting the size of her Song of the Week feature. I totally agree with Vanessa that the video player is huge and takes away from Shar’s written explanation. This may be too hard to address but is something Shar should look at when she has time to edit her site. Vanessa also pointed out Shar’s lack of diverse font use, I understand completely falling into complacency with the fonts the theme provides for you. Again, when time permits have a look at fooling around with them. Shar’s site features this logo, and in having this logo front and center takes away from the title of her website, Millennial Speaks. 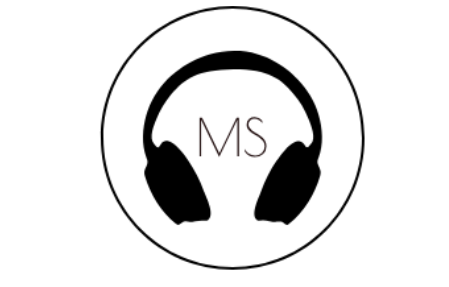 Upon seeing the logo, one may assume that MS is Shar’s initials it is only when you scroll down that the site name becomes apparent. I would recommend finding a way to enlarge the name of the website so that it is very obvious to new viewers that they are on Millennial Speaks. I am excited to keep reading and to follow Shar’s music journey. Congrats on building such a compelling and personal voice, that is inspiring and relatable to a wide audience.